SHANGHAI (AP) — The young woman is panting, panicked, her thin arm pointing at four men in police uniforms who had let themselves into her hotel room near midnight. The men, one carrying a pair of thin white plastic restraints, tell her they are doing a “routine inspection,” according to a video of the Nov. 11 incident seen by The Associated Press. Only there was nothing routine about this. 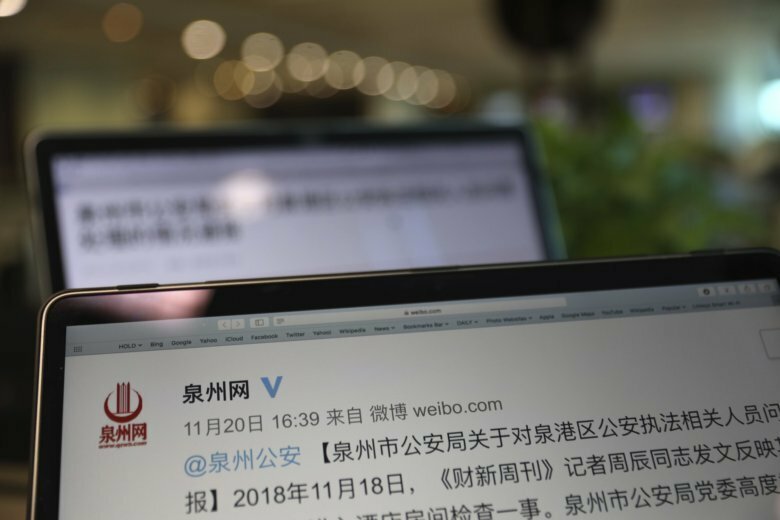 Their target was Zhou Chen, an environmental reporter for Caixin, one of China’s most respected business media groups. She was on a reporting trip to Quanzhou, a city in southeastern China’s Fujian province, to investigate a petrochemical leak that sickened more than 50 people. Reporters Without Borders ranks China 176 out of 180 in its World Press Freedom Index and says more than 50 journalists and bloggers are detained “in conditions that pose a threat to their lives.” China’s ruling Communist Party is eager to suppress information that might contribute to social instability, while local officials often try to interfere with reporting on sensitive topics. Zhou’s account of her terrifying night was published Monday in Caixin Weekly, part of the Caixin Media group. The police search capped a day of bullying, according to her article. She wrote that she had been blocked from taking photos by people wearing body cameras and tailed as a mother and daughter took her to see dead fish floating in their family fish farm. According to Zhou, the police didn’t show her any documents authorizing their late-night search, as required by Chinese law. Hotels in China must register their guests’ information with the police, and a hotel receptionist later told Zhou that the police had asked for her room card specifically. Other journalists rushed to support Zhou. Liang Yingfei, also a reporter at Caixin, wrote in a Tuesday blog post that she too had faced interference in the past. “Reporters being ‘accompanied’ as they work seems to have become the new normal,” she wrote.